A small section of the crowd gathered in Trafalgar Square London showing their approval for the words of the invited speakers that included people like Jeremy Corbyn and Tony Benn during the 1st massive national demonstration against the legislation contained in the 1994 Criminal Justice and Public Order Act 1994 designed to criminalise raves free parties free festivals and living a mobile lifestyle. A group of people raving on top of Sunnyside sound system on a lorry parked in front of the National Portrait Gallery in Trafalgar Square. 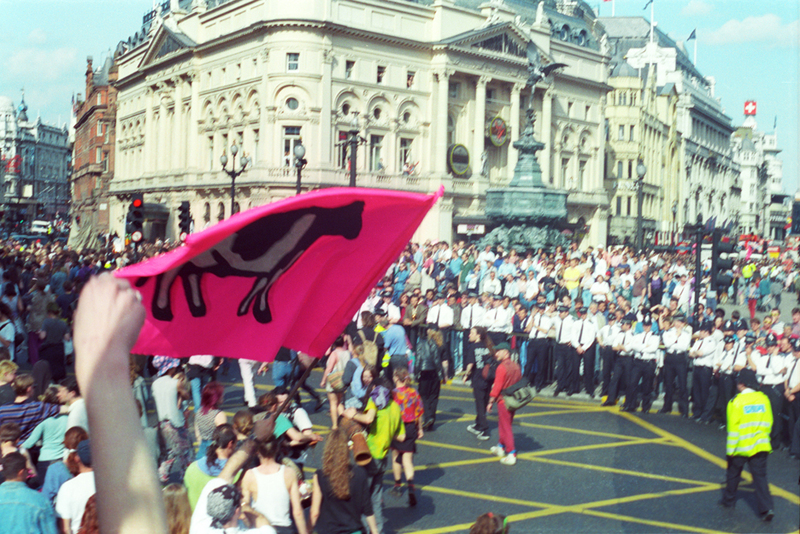 A man in front of Sunnyside sound system waves their pink flag depicting an image of a Friesian cow going by the name of Liberty the Sacred Cow. Two young people dancing on the roof of a bus shelter in Piccadilly to the music of Sunnyside sound system. Two young people sat on top of speakers from the Sunnyside sound system in Trafalgar Square on Mayday 1994. 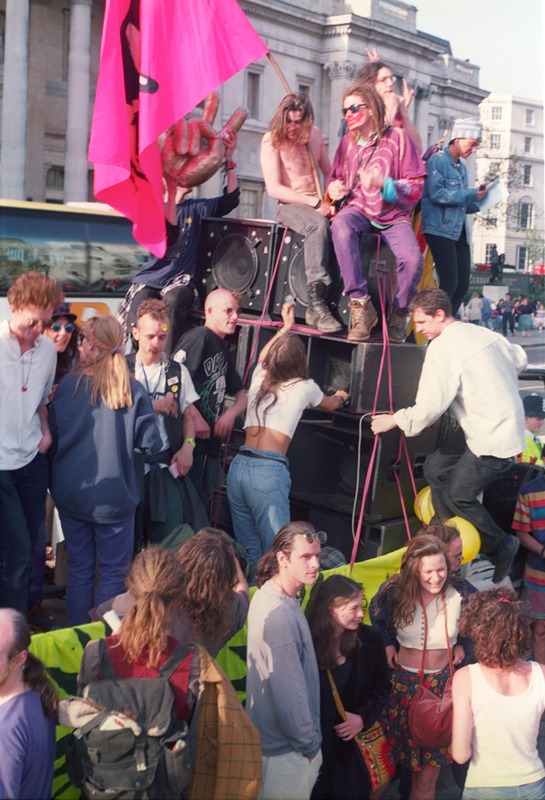 The “Just People” hippie bus driving through Trafalgar Square with two girls dancing on top of it going past Sunnyside sound system on Mayday 1994. A DJ from Sunnyside sound system puts the needle on the record in Trafalgar Square London on Mayday 1994. A portrait of a young man wearing wraparound sunglasses with a third eye drawn on his forehead raving on the back of the lorry containing Sunnyside sound system parked in front of the National Portrait Gallery in Trafalgar Square on Mayday 1994. A young man looks out from behind one of the speakers of Sunnyside sound system as it is driving on a lorry with the music playing past the Astoria on Tottenham Court Road, London. 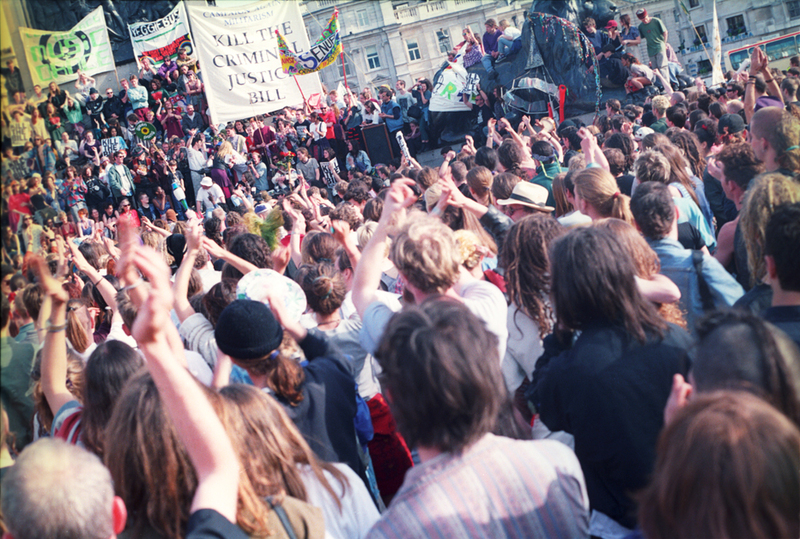 A group of ordinary young people taking part in the 1st national public demonstration against the Criminal Justice and Public Order Act 1994 on Mayday 1994. A lively girl blowing a whistle surrounded by a crowd of people gathered in Trafalgar Square dancing to the music of Sunnyside sound system.